Our cottoner places the cotton into the bottle as an inverted U (n) so that there are no wisps or strands protruding the Bottle. 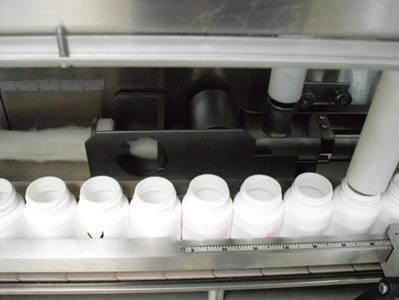 Consequently a finger on the cotton inserting machine pushes down on the cotton to allow it to spread inside the bottle and to ensure that the area around the neck of the bottle is clear for the capping. This is particularly important for caps that are induction sealed where it is essential that the sealing area is clean. 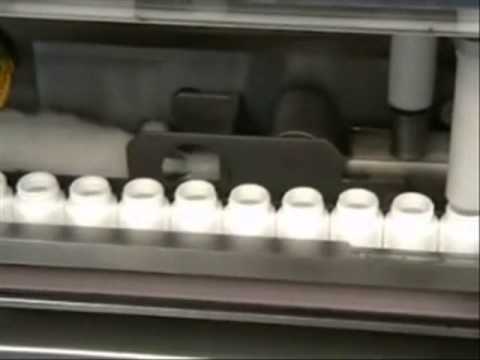 The machine is able to speed up to 100 bottles per minute with either cotton or rayon. Our cottoner use guillotine for cutting to ensure that the area around the bottle is wisp free.